The Domesday record for Woodborough (Udeburg) shows the village lands as occupied by three Saxon thanes and Southwell Minster holding property to the extent of 3½ carucates (420 acres), with the Prebend holding about 20 acres. Thus it seems likely that a Saxon church would have existed, but certainly a small Norman church was built about 1150 by the then Lord of the Manor, Ralph de Wodeburg, on the site of the present nave. 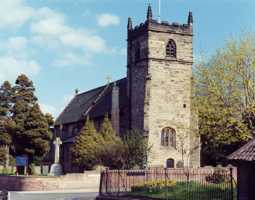 The present church was consecrated in 1335 but rebuilt and enlarged in 1356 by Richard de Strelley with a fine chancel, distinguished by its five light east window in the Decorated style. The nave is of poorer design, built slightly later, and the small square tower is late Perpendicular of about 1550. Special features include a sculptured gable cross on the east end of the roof, a feature only found elsewhere in Nottinghamshire at Clifton, shields of the Strelley family, Strelley of Strelley and Strelley of Woodborough above the outside of the east window, Kempe windows in the chancel, locally carved choir stalls and a Jacobean oak altar table given in 1660 by John Woode, Recorder of Newark.